Dumplings to Donuts is a blog by 2 small town kids who fell in love with each other, traveling, and adventures. This love of the unexpected has led us to jump out of planes, eat questionable food, and relocate to China. 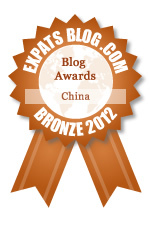 ExpatsBlog.com Expat Blog Awards 2012: China Bronze Award! This blog won the Bronze Award for best expat blog in China! Your adventures make me want to go to China. Love your unabashedly American take on another culture! I love catching up weekly on Donuts to Dumplings' hilarious adventures. She has a true gift of being able to paint a vivid picture of her experience for the readers, but still tells it in a concise way to not bore her audience. I love this blog! Makes me wish I lived in Shanghai! Donuts to Dumplings encapsulates what I imagine the true expat experience to be like. She explains the cultural differences with a perfect mix of both humor and reverence. Reading the posts make me wish I was traveling and laughing alongside her. Love this blog! I always look forward to the next adventure. Hopefully one day I can see some of these sites for myself. Donuts to Dumplings makes me wish I were an expat! I really enjoy reading about their crazy experiences in Shanghai, and learning about how different everyday life is in another part of the world. Kristin and Matthew have a beautiful blog. It's funny, compelling and full of stunning pictures. I believe what's best about it though is the true-to-life aspects of it. I feel their pain over pork floss. I see their joy at the reunion with Snowball. I understand their longing for things American while working to become citizens of Shanghai, too. It's beautiful and bittersweet. It makes me want to venture out and be a citizen of the world as well. I love how she introduces the quirks of Shanghai culture. It would be easy to complain about questionable meat and bathroom facilities that would make most Americans hold it for a week. But her positive attitude and curiosity educates readers in a fascinating way. Bravo Kristin! I love reading about your adventures!